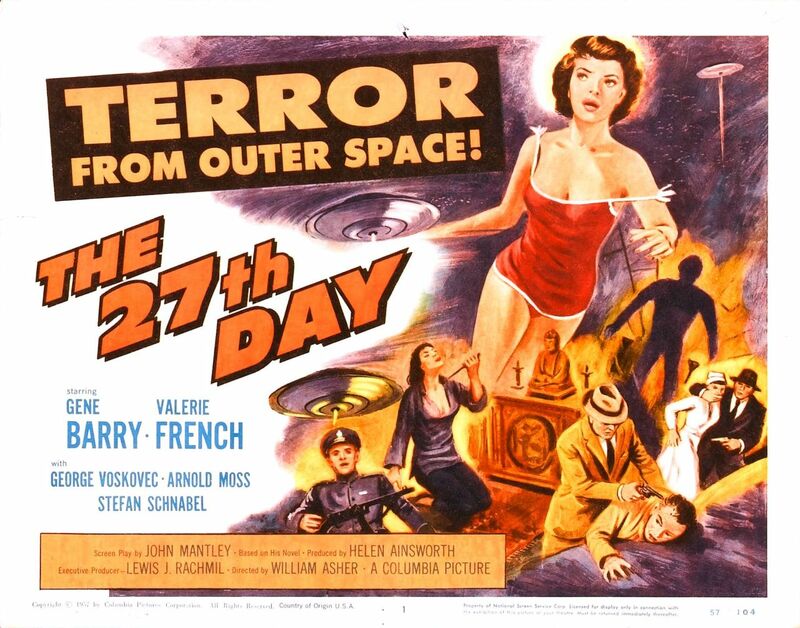 27TH DAY is a pulp red scare science fiction tale is the sort of thing they would never make today, or if they did would never come from a major studio. While on some level it’s a solid science fiction tale it’s so infused with us vs them, the commies are bad that it’s dated badly. The plot of the film has five people abducted by aliens. They are told they come from a dying world and looking for a place to settle. Since they are incapable of killing, they give each person a vial that if opened will wipe out 3000 square miles. The box the vials are in can only be opened by the person it was given to, however anyone can open the vial. After 27 days the vials will be rendered inert. The people are then put back where they came from. One girl throws her vial into the ocean. Another woman commits suicide. The others go about life until the aliens inform the world of the vials. Two go into hiding while the Soviet soldier if grabbed and tortured for information. The Americans try desperately try to determine if the commies are going to destroy America. Enjoyable on its own terms 27TH DAY, has gotten lost in sands of time with its red scare red baiting. The commies are very much the bad guys here and if it wasn’t for them everything would be great. The attitude is quaint and now quite laughable, though with the saber rattling behavior of the current leader of Russia it may go back into favor. Only if you get past the red menace will you have any chance of enjoying the film. In its own way 27TH DAY is a perfect addition to all of the other serious science fiction films from the period. Closer to IT CAME FROM OUT SPACE, WAR OF THE WORLDS and other George Pal Science fiction films, 27th Day gets you thinking. If you get past the us vs them nonsense the film raises some interesting questions about human nature. What would you do if given this ‘gift’? What do you think your government would do and what would other people do? While the answers are less clear cut then when this film was made, the questions are perhaps even more relevant than before. I really like this film a great deal. While I’m not going to lie and say I’d put this on over something with monsters, but on a night that I wanted something headier I’d gladly put this on.